Apollo 18 has some nice ideas, some impressive effects work and a decent finale, but the first half is extremely dull and it's ultimately let down by frustrating sound design work, severe pacing problems and some incoherent editing. 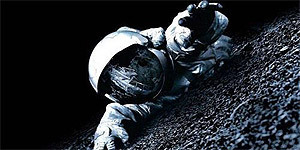 Directed by Gonzalo Lopez-Gallego, Apollo 18 presents itself as found footage from a top secret, supposedly unmanned space mission that went disastrously wrong in 1973. Tasked with planting a tracking device to spy on the Russians, three American astronauts (Warren Christie, Lloyd Owen and Ryan Robbins) instead discover a crashed Russian spacecraft and a decomposing cosmonaut, leading them to suspect that NASA and the Department of Defense know more than they're letting on. However, things quickly go from bad to worse when one of the astronauts gets bitten by a mysterious rock-like creature and begins to develop a strange infection. The performances are fine, though the found footage set-up doesn't allow for much in the way of meaningful exchanges of dialogue. In fact, the film's strongest element – its production design - also proves to be its biggest drawback, because the authenticity of the supposed 1970s footage means that the camerawork is blurry and the sound design work (particularly the radio communication with NASA) is often difficult to hear. That said, the effects work is impressive and suitably creepy, especially considering the relatively low budget. Similarly, the film has some nice ideas (much better this conspiracy theory than the “we never went to the moon in the first place” conspiracy theory) and rallies for an exciting climax, although by then it's a case of too little, too late. Aside from the frustrating sound design work, the film's biggest problem is the editing: considering this is meant to be a found footage film, it has been over-edited to within an inch of its life, to the point where the action flicks incoherently from a scene of nothing happening to another scene of nothing happening, making it impossible to tell what's going on for most of the first half. On top of that, the severe pacing problems mean that it never really gets going until the final twenty minutes and, the odd shock moment aside, there are precious few scares along the way. In short, Apollo 18 has some nice ideas and builds to a decent climax, but it's hard to escape the feeling that the found footage conceit doesn't really do it any favours and it might have worked better as a proper feature.